Recruitment for Camp UKnight 2019 has BEGUN. Please REGISTER HERE. 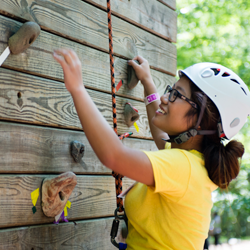 These pre-orientation sessions are three day, two night experiences that take place in the Pocono Mountains of Pennsylvania at Stony Acres Adventure Camp. First-year and transfer students are invited to come together to build an instant and sustainable community of friends to help ease the transition into college while learning Rutgers traditions and valuable leadership skills that will allow our students to make an immediate impact on the campus community. A large institution like Rutgers can be intimidating, but Camp UKnight helps students to build amazing friendships that will last through their college career and beyond. Also, since Camp UKnight is run by a dedicated group of established Rutgers Student Leaders, students will build a network to jump start their first year on campus! Camp UKnight also gives you an opportunity to develop essential leadership, teamwork, and communication skills before students arrive on campus. They can build these skills by hiking the natural wonder of Boulder Field, repelling off a 30-foot climbing wall, having fire side chats with established leaders and professionals, and much more! Camp UKnight helps build the foundations for success and gives you an opportunity to develop the confidence to make an immediate impact on campus. The enrollment fee is only $199 which includes lodging, all meals, all on site activities, branded apparel, and all transportation expenses to and from the camp site. The Discovery Program 2019 will take place Sunday, August 25 through Tuesday, August 27. As part of the registration for this program, you will also be put on the EARLY MOVE IN list which allows you to move into your Residence Hall early. Recruitment for the Discovery Program 2019 has BEGUN. Please REGISTER HERE. The Discovery Program is a three day, two night immersion retreat that will take place just before students arrive for their first days at Rutgers. While the program takes place in various locations both on and off the Rutgers-New Brunswick campus, all participants will be granted early move in. The housing for the dates of the program will be at a local hotel near New Brunswick for Service and Social Justice or at the camp site for Adventure and Sustainability. The Discovery Program encourages incoming students to be active in their own learning and provides opportunities to develop powerful leadership skills that will be instantly useful both in and out of the classrooms at Rutgers. 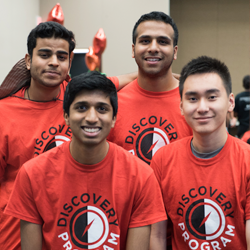 The Discovery Program is designed to help incoming first-year and transfer students make connections with other like-minded Scarlet Knights. The Rutgers community is very large and this program helps to make it feel more like home by providing opportunities for new friendships with other incoming students and current Rutgers Leaders. The enrollment fee is only $250 which includes lodging, all meals, all on site activities, all transportation expenses to and from all sites, and addition of your name to the early move in list. Who goes to Camp UKnight? Camp UKnight is open to any new students who will be attending Rutgers in the fall. This includes both first year students and transfer students. There are two camps available. There will be a mix of both first year student and transfers at both sessions. When and where is Camp UKnight? Camp UKnight is located at Stony Acres in Marshall’s Creek, Pennsylvania.The dates for Summer 2019 are Session ONE from August 2-4 and Session TWO from August 9-11. How much does Camp UKnight cost? The cost of Camp UKnight is $199, which includes all program meals, lodging, activities, branded apparel, and transportation to/from Rutgers University. Is financial aid available for Camp UKnight? Financial Assistance is available to those who demonstrate need for financial aid. You can apply for scholarships, payment plans, and partial/full fee waivers. How do I register for Camp UKnight? Register for Camp UKnight by clicking here. To attend Camp UKnight, do I have to register for the accompanying Orientation session? No. Although Camp UKnight is a convenient extension to the Orientation sessions that are scheduled before each camp, we encourage students to sign up for whichever Orientation session works best for them. More information regarding New Student Orientation can be found at here. All activities and meals are included in the cost of Camp UKnight. What do I not bring to camp? Any items that are extremely important to you or expensive should probably be left at home. Any alcohol, drugs, or weapons of any kind (including pocket knives) are not allowed at camp. We take this issue very seriously, and if you are caught with any of these items, you will be sent home without a refund and referred to the Rutgers Office of Student Conduct. More information regarding the University Code of Student Conduct can be found at studentconduct.rutgers.edu. It is the student’s responsibility to send a cancellation request email to lead@echo.rutgers.edu by July 12, 2019 in order to cancel and receive a full refund. No cancellations will be taken by phone. There will be no refunds issued after this date. Feel free to connect with us on Facebook, Twitter, and Instagram! You can also reach out via email at lead@echo.rutgers.edu or call us at 848-932-4089.
Who goes to Discovery Program? Discovery Program is open to any new students who will be attending Rutgers in the fall. This includes both first year students and transfer students. When and where is Discovery Program? The Discovery Program 2019 will take place, Sunday, August 25 through Tuesday, August 27. As part of the registration for this program, you will also be put on the EARLY MOVE IN list which allows you to move into your Residence Hall early. The Community Service, Social Justice and Entrepreneurship tracks of the program will take place on campus in New Brunswick and in the surrounding neighborhoods. The Adventure and Sustainability tracks will take place at various local outdoor locations. How much does Discovery Program cost? The cost of Discovery Program is $250, which includes all program meals, lodging, activities, transportation to/from all locations, and your placement on the early move in list. Is financial aid available for Discovery Program? How do I register for Discovery Program? Register for Discovery Program by clicking here. All activities and meals are included in the cost of Discovery Program. What do I bring to Discovery Program? What do I not bring to Discovery Program? Any items that are extremely important to you or expensive should probably be left at home. Any alcohol, drugs, or weapons of any kind (including pocket knives) are not allowed. We take this issue very seriously, and if you are caught with any of these items, you will be sent home without a refund and referred to the Rutgers Office of Student Conduct. More information regarding the University Code of Student Conduct can be found at studentconduct.rutgers.edu. It is the student’s responsibility to send a cancellation request email to lead@echo.rutgers.edu by July 31, 2019 in order to cancel and receive a full refund. No cancellations will be taken by phone. There will be no refunds issued after this date. Feel free to connect with us on Facebook, Twitter, and Instagram! You can also reach out via email at lead@echo.rutgers.edu or call us at 848-932-4092.